In this episode we are happy to host Michael Pawlyn, a British architect noted for his work in the field of biomimetic architecture and innovation. This thrilling contemporary philosophy looks at nature to find solutions for sustainability. Architecture is one of the main fields of application of Biomimicry. 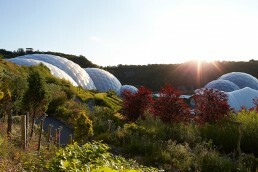 Michael has worked on some extraordinary buildings, such as “The Eden Project” in Cornwall, England, the world largest greenhouse, whose domes are inspired by soap bubbles and pollen grains. Working on this futuristic structure, Michael felt that his three passions, biology, design and the environment could finally merge and create a unique mix to develop sustainable solutions for the future of humankind. Michael Pawlyn is also the author of “Biomimicry in Architecture”, now at its second, fully updated edition. It is a fascinating read not only for architects, but for everyone interested in exploring a new logic of practical connection with nature and its most profound wisdom to prepare for the challenges of building a sustainable and restorative future. The book looks to the natural world to achieve radical increases in resource efficiency. Packed with case studies predicting future trends, it also contains chapters on structures, materials, waste, water, thermal control and energy, as well as an all-new chapter on light. Discover more about biomimicry, about Michael, and his latest project inspired by camel’s nostrils, and about what inspires him in Damanhur. Has this video inspired you to look for ways to apply nature solutions in your life today? Please, share with us in the comments below.